07/11/17 – 3TEETH • Justin Symbol and the God Bombs • DJ Xris SMack! 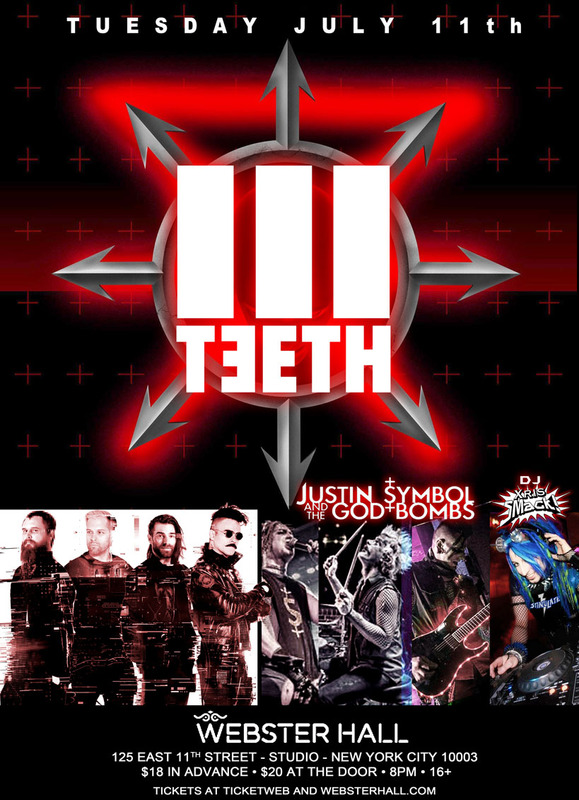 3TEETH • Justin Symbol and the God Bombs • DJ Xris SMack! 3Teeth (stylized as 3TƎETH) is an American Industrial band from Los Angeles, California. Their self-titled debut album was released in 2014. The band is known for its lockstep grooves, ominous atmosphere and intense visual presentation often relying on coarse imagery. The band was selected by Tool to be their supporting act on their 2016 North American tour and have since opened for Rammstein in several U.S. shows. With the release of debut album 'VΩIDHEAD' on Halloween 2014, Justin Symbol emerged as a bold new force in the national rock scene. The album features co-founding Marilyn Manson guitarist Daisy Berkowitz and was accompanied multiple U.S. tours. Symbol and his band have gained a dedicated national cult following with their theatrical and high energy live performances. Their second full length album is due Fall 2017.
:3 Teeth, 3Teeth, Industrial, industrial Metal, industrial Music, Justin Symbol, Justin Symbol and the God Bombs, Metal, Webster Hall, Xris SMack!